ONTRAforms allow you to create a series of forms that will add data to a single Contact Record. This is a great way to gather information about a contact, conduct a survey, etc. without having to subject them to a long, intimidating opt in form. Data entered is written to the Contact Record with each form. The key to this strategy is to collect the email address on the first form in the series. Set the Thank You page to pop up the second form. You can continue to add additional forms to the series, linking them by having the form's Thank You page setting pop up the next form. Follow the tutorial below to create your first progressive form series, using three forms to collect email, first name and last name. This example uses the three ONTRAforms and an ONTRApages page. Create the first form by clicking Contacts > Forms > New Form. Select Create New in the ONTRAform selection box. Select a template for your first form. 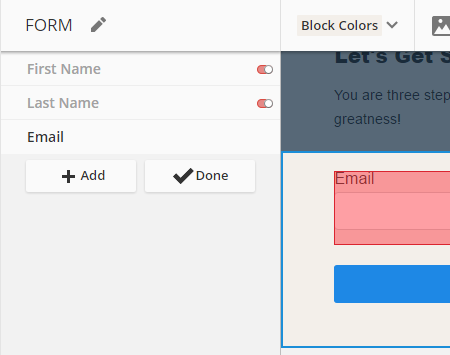 Click Smart Form on the palette then Form to edit the form's fields. Hide all the fields except Email, then click Done. The Email field will create a new contact or, if the email already exists in your database, link the series to that existing contact. Name the form PF: 1-Email and click the Save button. Create a second form, choosing the same template as above. 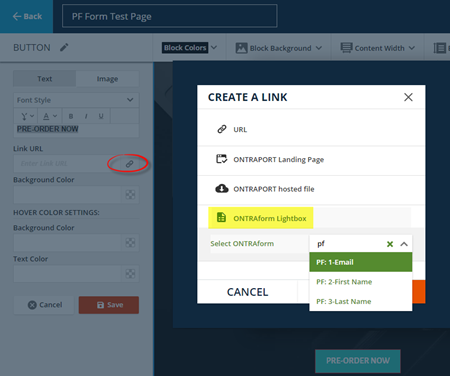 Click Smart Form on the palette then Form to edit the form's fields. Hide all the fields except First Name, then click Done. Name the form PF: 2-First Name and Save the form. Exit the form. Create the third form in the same manner as above, choosing Last Name as the only field shown. Name this form PF: 3-Last Name, save it and exit the form. The three forms have been created, and not we can link them all together. Open the first form, PF: 1-Email for editing. Click on Smart Form in the palette, then click on the gear icon next to Form Settings. 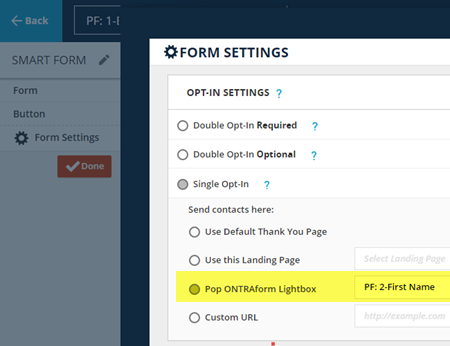 On the Form Settings pop up, select Single opt-in, and check the Pop ONTRAform Lightbox radio button. Select the second form you created above, PF: 2-First Name from the drop down selection box. Open the second form, PF: 2-First Name, for editing. Click on Smart Form in the palette, then click on the gear icon next to Form Settings. On the Form Settings pop up, select Single opt-in, and check the Pop ONTRAform Lightbox radio button. Select the third form you created above, PF: 3-Last Name from the drop down selection box. Save and exit the second form. Open the third form, PF: 3-Last Name, for editing. Because this is the last form in the series, we won't be repeating the same steps. Instead, click on Smart Form in the palette, then click on the gear icon next to Form Settings. Select Single opt-in, and set the Thank You page you want to use. Save and exit the form. If you had additional forms in the series after this one, you would select the next form in the Pop ONTRAform Lightbox drop down. Only the last form will have a traditional "thank you" page. You can host the first form in the series anywhere an ONTRAform can be embedded, on a static HTML page, in a WordPress post or page, or even an ONTRApage as shown in the next section. Here's how to attach the progressive form series to an ONTRApage link or call to action button. Click on Sites > Landing Pages > New Landing Page and select ONTRApages. Choose a template with a call to action button. When satisfied with the layout, we click the button on the block to edit it, and click on the link icon in the Link URL field. On the pop up, select ONTRAform Lightbox and choose the first form, PF: 1-Email from the drop down. Click Okay, then Save in the palette to save your choice. Name the ONTRApage and Publish the form. That's how easy it is to embed it into an ONTRApage. Visit the URL where the first form is hosted in your browser, and click the button or link to pop up the first form. Fill in a test email, then click Submit. The second form will appear, and you can enter your first name and click Submit, then the third form will pop up for the last name. Go through the series and then verify that your new contact is created with all three data elements, email, first name and last name.